This individual Report The ATM Turns 40 - Time For a Change is available for purchase. This Report is available to members of Mercator Advisory Group’s Debit Advisory Service. Please be advised that this Report is normally part of a research and advisory service that provides ongoing support throughout the year. As such, this Report contains significant depth of content that is selected for its strategic importance to our members. (For a description of these services, see our Advisory Services section). This report evaluates the current ATM environment and the value chain of participants as it exists today and the future of this ubiquitous self-service device. As the ATM turns 40 this year, Mercator Advisory Group looks at this historic event through the eyes of the Financial Institution (FI) and the Independent Sales Organization (ISO) and the strategic position the ATM holds within each organization. How each organization defines the role of the ATM will determine this strategic position. There is one ATM for every 284 American households. The number of transactions per ATM is flat with relatively few high volume locations left unserved in the United States. The ATM manufacturers are looking to new markets. Financial Institutions continually operate their ATMs at a loss and are looking for new ways to re-invent and revitalize their current network. ISO's are being squeezed by falling profit margins from decreased transaction volumes coupled with increased costs of rent, servicing contracts, cost of funds, and are looking for alternatives to generate revenue. 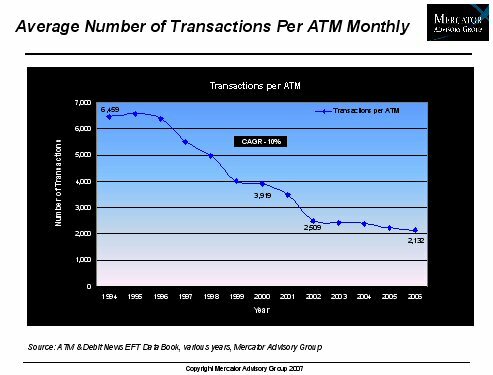 Patty Hayward, Senior Analyst of the Debit Advisory Service for Mercator Advisory Group and the author of this report indicates that the US ATM market is stagnant: "As the US market contracts with less ATM's shipped in 2006 and the number of transactions per ATM falling, the industry must take a look at what is on the horizon. The market is clearly changing at a rapid pace, but why are ATM's not taking on any new roles?" The ATM channel has many participants which contribute to the overall success of the industry. But many participants also have created an infrastructure with challenges that have contributed to the stagnation of the ATM and its ability to deliver value beyond the basic cash and deposit taking functions. "ATM channel complexity has resulted in an outdated misaligned infrastructure that creates barriers between ATM channel participants (ATM manufacturers, ATM Drivers, and Issuing Processors). The barriers created by this complexity have prevented the ATM from evolving past the original cash dispenser value." ISO's in a response to the shrinking profit margins in the ATM market; have been exploring the financial kiosk market trying to generate new opportunities for revenue growth. It is still a young market but it has potential to provide financial services to an untapped market - the functionality of the kiosk just needs to make sense to the merchant deploying it and the end user. Internationally the ATM market is ripe with many opportunities for ATM deployment. ATM manufacturers will be looking to these new markets for growth. Mercator Advisory Group cautions the international market to examine the current US infrastructure and evaluate whether the solutions offered today can carry your market into the future without the same challenges. This report is 32 pages long and contains 14 exhibits, and tables.